The ITC RailRest, Olive Wet Suit has no bullet pouches, bulky strap systems, screws, or buckles to interfere with your grip. Just a functional custom fit for perfect eye alignment and faster first shot capability on those thin-railed stocks. Suggested applications: Any thin-railed, tubular or collapsible rifle, shotgun or crossbow stock that requires your eye to be in alignment with the center of the scope or rear site, rifle or shotguns that kick like a mule, young marksman that need a bit of a cushion or rise in the comb area to compensate for being of small stature. • Each hook & loop strap is 12" long that can be cut to your specs. 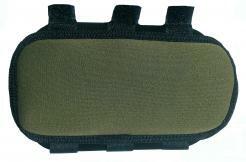 • Non-slip rubber back to prevent movement on the stock. • Hidden internal pouch for placement of height adjusting waterproof pads.